NASHVILLE, Tenn.— Gaither Music Group has recently released an all-new docu-musical experience on DVD and CD featuring some of the most well-known talents from the Gaither Homecoming stage. The Circuit Rider DVD rode straight to the top of this past week's Billboard Music Video chart in addition to the Christian Music Video chart, according to Nielsen Soundscan, garnering the No. 1 position on both. The audio version of the docu-musical also claimed the No. 1 position on the Southern Gospel Album Sales chart and a Top 20 spot on the Contemporary Christian Music chart. 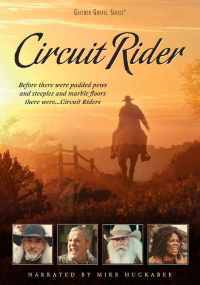 Created by Suzanne Jennings and Woody Wright, Circuit Rider portrays the spiritual formation of a nation and church shaped in part by the dedication and vision of these circuit riders. These musical performances and readings, sung and read by some of the most well-loved gospel artists, tell the story of these preachers who blazed the trail to share the gospel of Jesus with people of every race and nationality living in little towns and settlements across the nation. It’s hard to imagine, sitting in our modern-day mega churches, that there was a time when towns had no church buildings. And if they did have a small building for church services, they often had no local pastor to speak of. Enter the circuit rider, usually on a weary horse, straddling saddlebags that carried his hymnbook, Bible and a few personal items. These brave men and women, from every denomination and creed, understood the meaning of perseverance and sacrifice. Their stories are not often told, but they are as much a part of the American landscape as Mt. Rushmore and the Grand Canyon. That story of hardships, revivals, baptism, sanctification and suffering is captured through performances and readings by award-winning artists including Guy Penrod, Russ Taff, William Lee Golden, Gloria Gaither, Lynda Randle, Tanya Goodman Sykes, Mark Lowry, Benjy Gaither, Woody Wright, Buddy Greene, Judy Martin Hess, the Isaacs, Joy Gardner, Reggie Smith, Charlotte Ritchie, Angie Primm, Michael Sykes and more. The DVD is hosted by former governor of Arkansas, talk show host and presidential nominee Mike Huckabee. “I had been a Baptist boy all of my life when I attended two Wesleyan congregations in Nashville,” recalls co-creator Woody Wright. “I read a few books to study up on the theological differences. When I began to look at the history of where the different church groups came from, I began to read the autobiography of Peter Cartwright and I could not stop. His colorful detail of life as a circuit-riding preacher in the 1800s left me spellbound. Gaither Music Group brought in the acclaimed Michael Merriman to direct the filmmaking, and he and Stephanie Reeves produced the live performances, taped at Fiddler’s Grove Historic Village in Lebanon, Tennessee. Suzanne and Michael Nolen teamed up for the screenwriting. The Circuit Rider TV special is currently airing on a large number of networks including PBS, DirecTV, Dish TV, AT&T U-verse, TBN, RFD, GaitherTV, FamilyNet, CTN, GMC, GMTN, Guardian, Liberty, TCT and TLN. In Canada it is airing on Vision TV, The Miracle Channel, CTS and Hope TV. Circuit Rider is exclusively distributed by Capitol Christian Distribution and is available throughout general market stores and the Christian marketplace in addition to online retailers including iTunes, Amazon and Gaither.com.